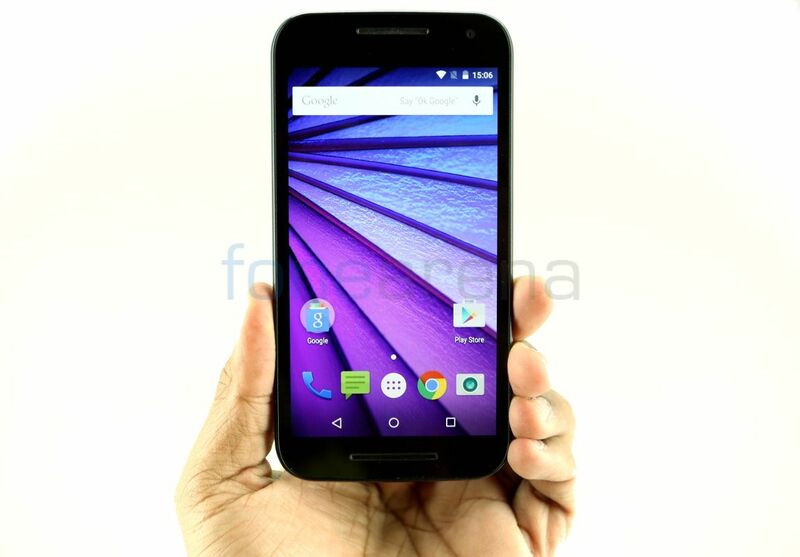 Motorola launched the Moto G (3rd Gen) in India last month. Compared to last year’s Moto G (2nd Gen), the third-generation Moto G retains the same display, but it comes with a better camera, faster processor and 4G support. It is also the first smartphone in the Moto G series that is water resistant, since the other two just have water repellent nano-coating. Is the smartphone worth the price? Let us find out in the complete review. 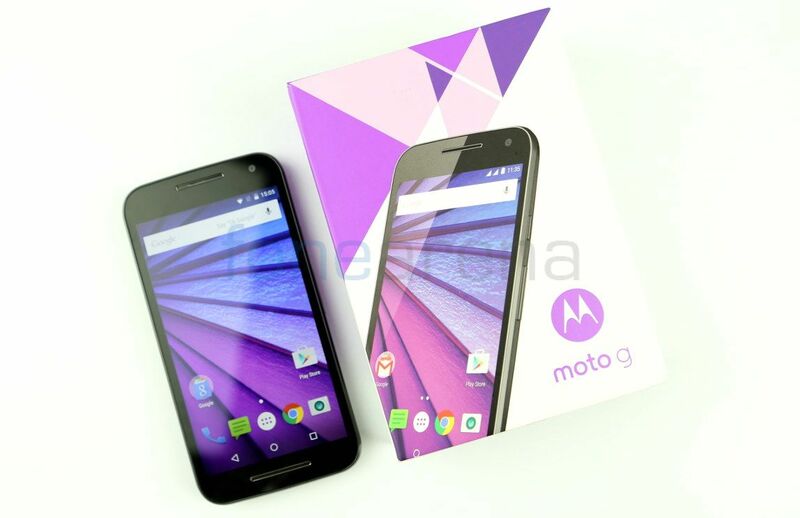 We unboxed the Moto G (3rd Gen) recently, check out the video. The Moto G (3rd Generation) has the same 5-inch display with a resolution of 1280 x 720 pixels and a pixel density of about 294 ppi (pixels per inch) with Corning Gorilla Glass 3 protection that was present in the Moto G (2nd Generation). The display is bright, brighter than the last year’s Moto G. The colors are vibrant, has decent viewing angles and the sunlight legibility is good too. Overall the display is good, but still Motorola could have offered a 1080p display, since most of the competitors offer smartphones with a full HD screen in this price range. There is an earpiece and the usual set of proximity and ambient light sensors along with a 5-megapixel front-facing camera on the front. It can record videos at 1080p resolution. The 5MP camera with f/2.2 aperture is good for selfies and video chats. The front camera is a huge improvement compared to the Moto G (2nd Gen). 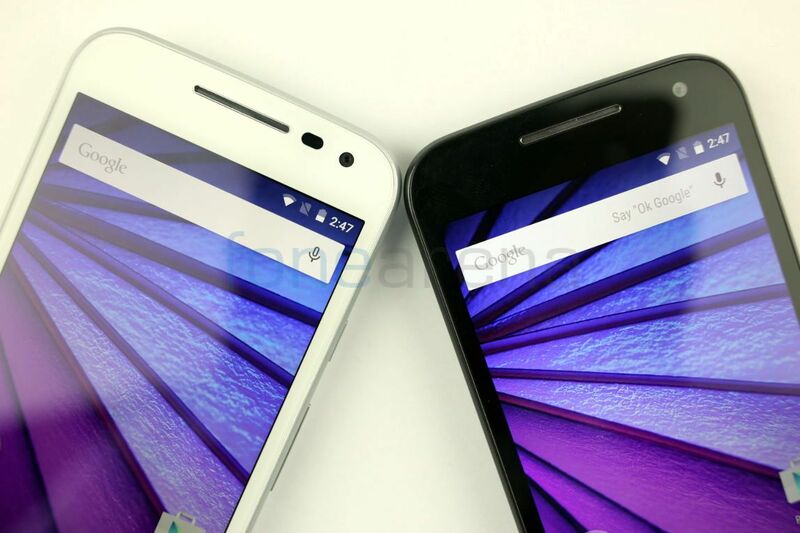 It lacks an LED notification light that was present in both first and second-generation Moto G smartphones. There is a loudspeaker grill below the display. Since it uses on-screen buttons, you don’t find touch buttons. 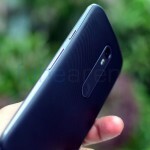 Unlike the previous Moto G smartphone that has dual front-facing speakers, the new Moto G only has a single loudspeaker. The microphone is also present somewhere within grill, since it is not visible. Gap in the earpiece and loudspeaker grills can attract dust easily, but the design helps to clean them easily, compared to the large grill on the second-generation Moto G.
The smartphone has a chrome rim running on the sides. The power button and the volume rockers are present on the right side. 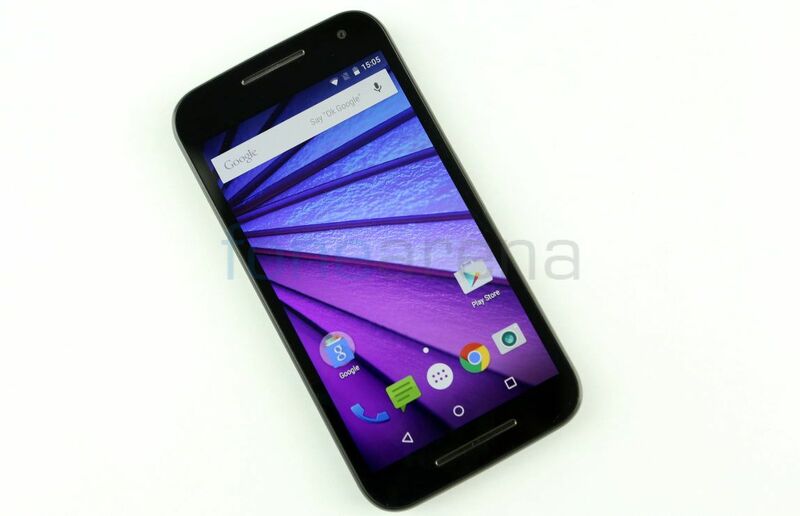 The power button has a rough feel, similar to the power button on the Nexus 6 or the Moto E (2nd Gen). 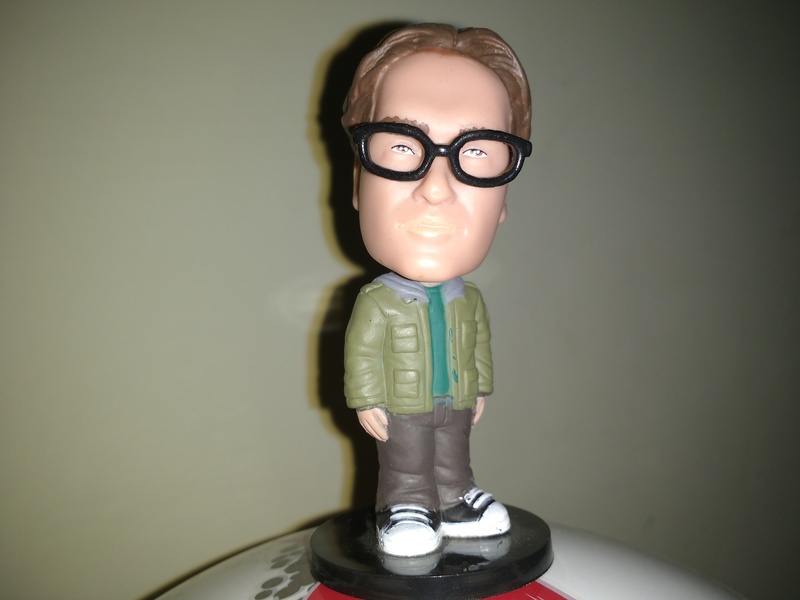 On the top there is a 3.5mm audio jack along with a secondary microphone. The micro USB slot is present on the bottom. 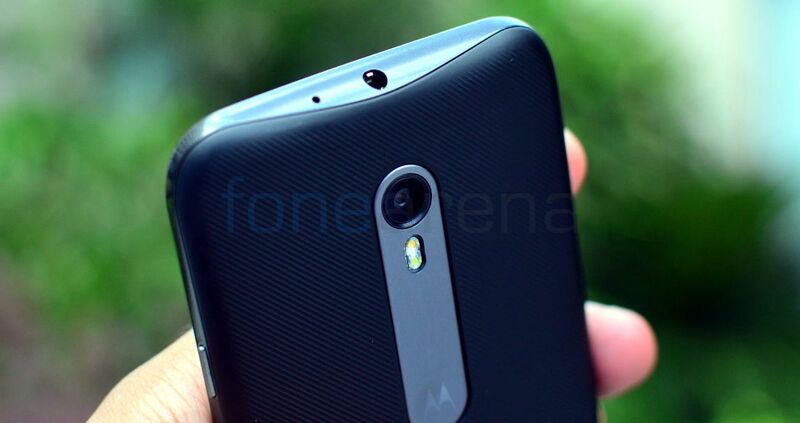 The phone has a curved design, similar to other Moto E and G series phones. It is 11.6 mm on the thickest point and is 6.1mm on its thinnest point. This is slightly thicker than the Moto G (2nd Gen). 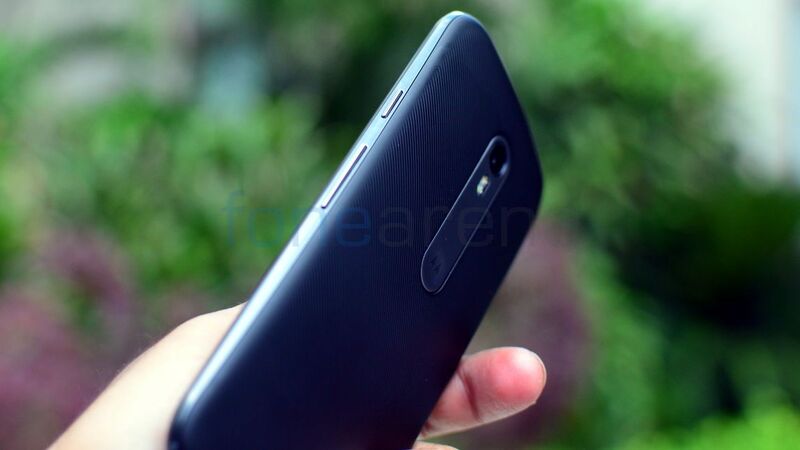 It is 142.1mm tall and 72.4mm wide, making it slightly taller and wider than the last year’s Moto G, which is 141.5mm tall and 70.7mm wide. 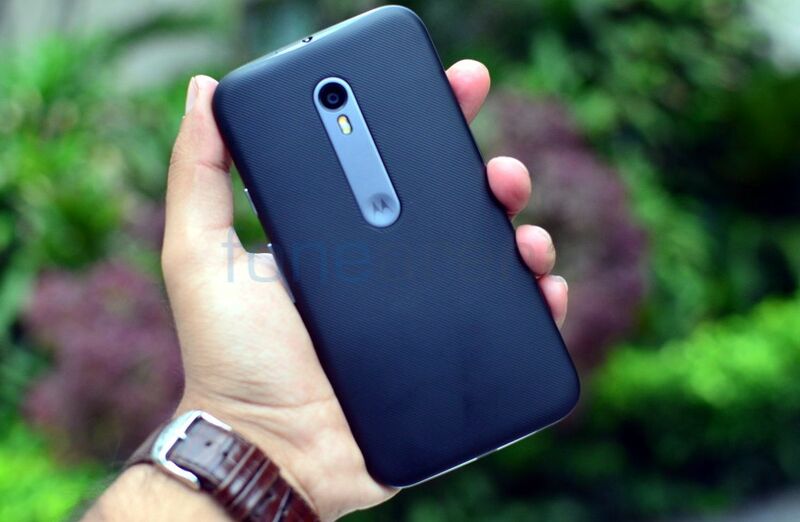 It is also slightly heavier than the earlier Moto G, weighing at 155 grams. 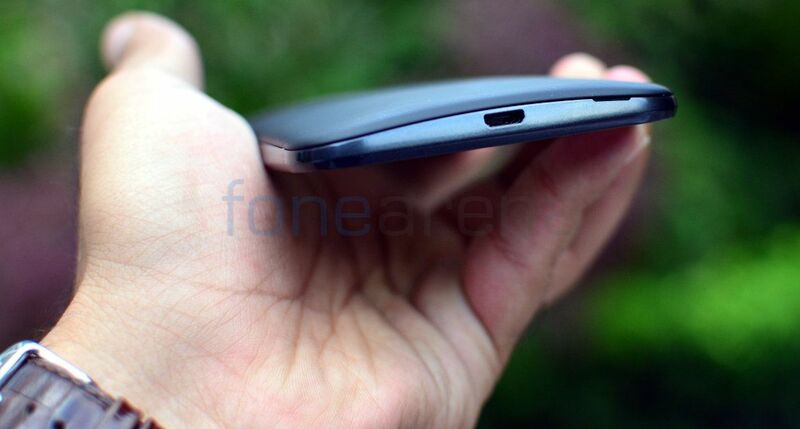 The brushed metal-like finish on the sides offers a good grip. The main advantage of the smartphone is that it has IPX7 ratings for water resistance. This keeps the phone safe from splashes and even drops in fresh water up to 3 feet for up to 30 minutes, but the back cover needs to be properly sealed. After turning on the smartphone for the first time, you get a notification slide that tells you how to properly close the back cover of the phone by pressing all the edges and the part near the camera. It is not dustproof like some Sony Xperia smartphones. The back panel with rugged patterns also offers a good grip. I felt the White version offered better grip compared to the Black, even though both are made of the same material. White also looks more stylish compared to the black. It attracts dust easily, but you can easily wash the phone if it gets dirty, since it is water resistant. 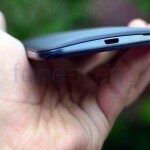 Overall, the smartphone has a solid build quality. 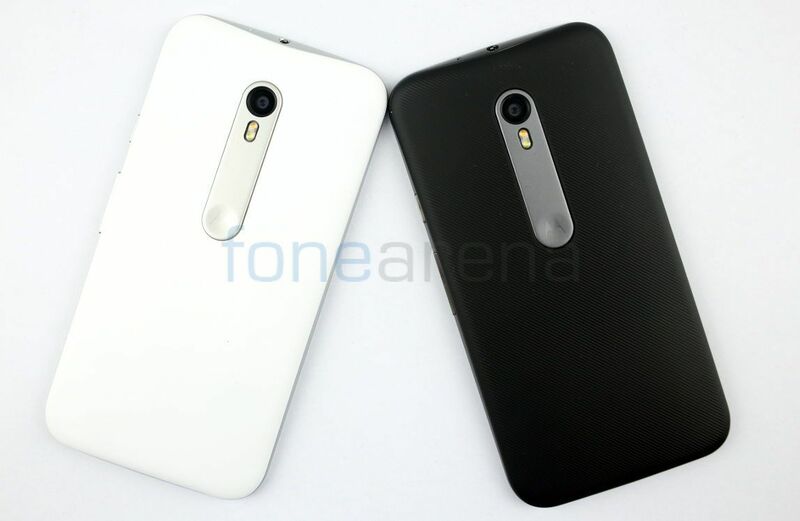 Motorola also sells replaceable back covers for the smartphone in 10 different colors at Rs. 999 and the flip covers that comes in 5 different colors is priced at Rs. 1,799. The flip cover protects the display from scratches, has magnets that stick to the device nicely, and even facilitate the lock/unlock option. 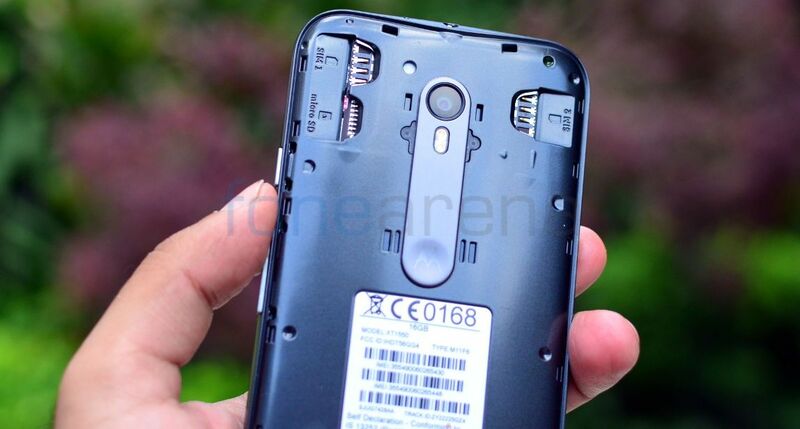 The Moto G (3rd Gen) has two micro SIM slots and a micro SD card slot (cards up to 32 GB) under the back cover. It is easy to remove or insert SIM cards, unlike the Moto G (2nd Gen). 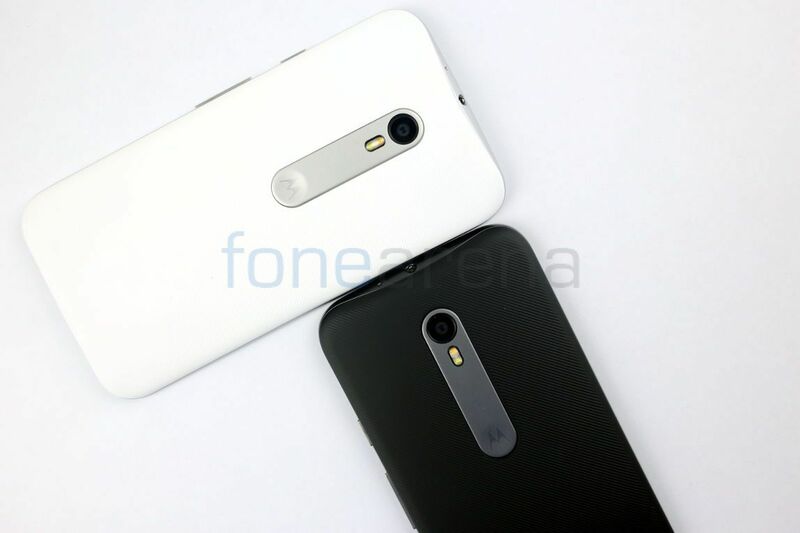 It has a 2470mAh battery, but the battery is not removable like previous generation Moto G smartphones. It has a 13-megapixel camera with Sony IMX214 Exmor RS sensor, f/2.0 aperture and True-Tone LED flash. It is the same sensor used in the Nexus 6, but this lacks OIS. 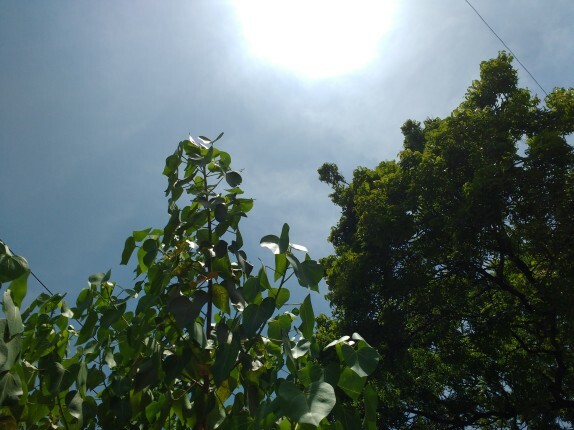 The camera UI is simple, similar to other Moto smartphones. There is an option to control focus & exposure, drag the bracket where you need to set the focus. It also has quick capture feature that lets you just twist your wrist quickly to launch the camera. This doesn’t work always. Daylight images and macro shots were good with vibrant color output, but low-light shots has noise most of the time and lacks details. Focus is a bit hard at times using the focus bracket. 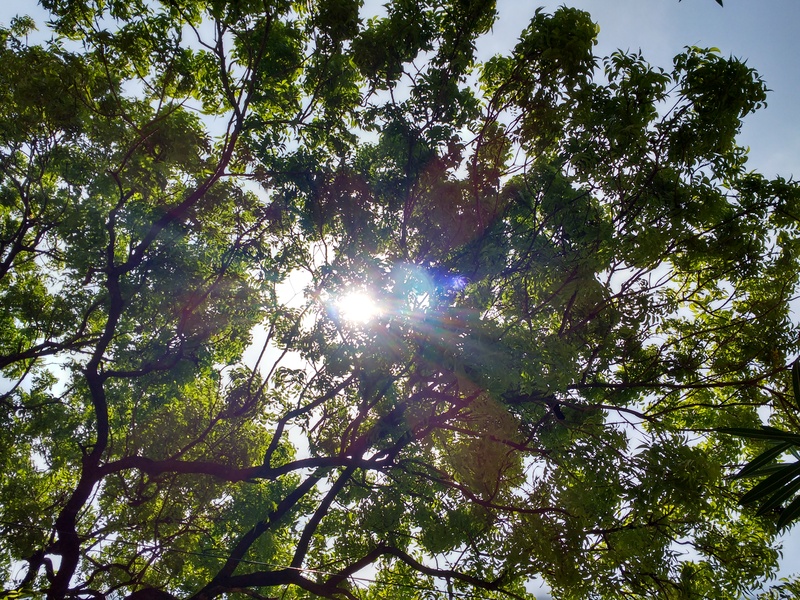 HDR shots are over saturated and too sharp. Thanks to the True-Tone LED flash, it helps to maintain the skin color and is not overpowering. 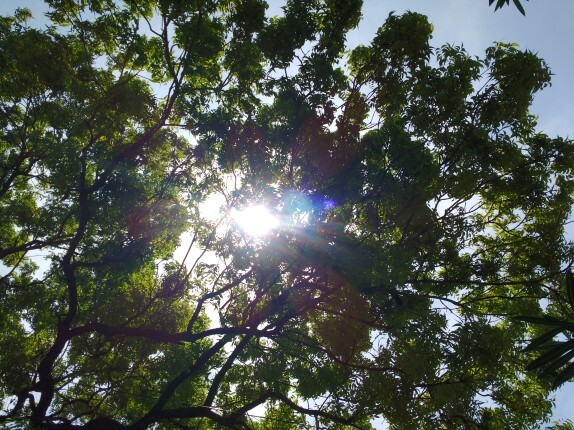 Check out the complete set of Motorola Moto G (3rd Gen) camera samples here. It can record videos at 1080p full HD resolution at 30 fps. Video has good details. Audio output is also good, thanks to the secondary microphone. It can also record slow-motion videos at 720p HD resolution. This actually takes videos at 720p HD resolution at 60 fps and reduces the frame rate to 1/4th from the original video to 15 fps, similar to earlier Moto G smartphones. You can even use the editor in the gallery app to edit slow motion videos to make only a part of it in slow motion and the remaining in normal speed. Check out the 1080p and slow motion video samples. 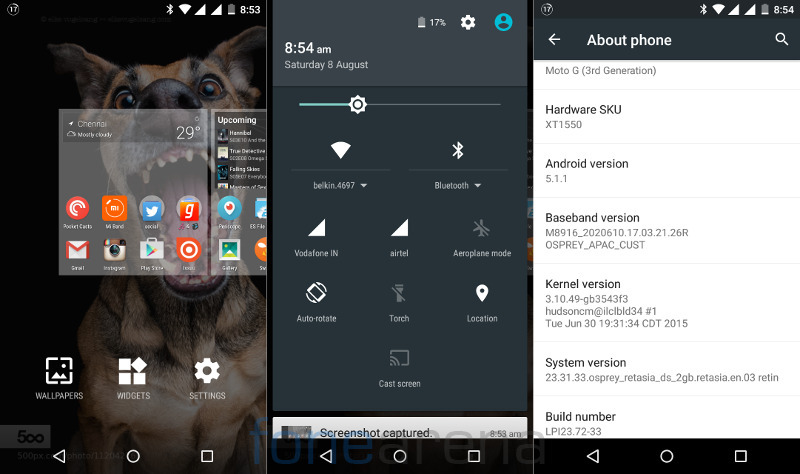 Coming to the software, the phone runs on Android 5.1.1 (Lollipop), which is almost stock. There is nothing to mention about the software in specific since it offers stock Android experience. It has Google Now launcher as default. We have the 2GB RAM variant with 16GB storage. Out of 2GB of RAM you get 1914MB of usable RAM, out of which 1.3GB of RAM is free on boot with just the default apps running in the background. 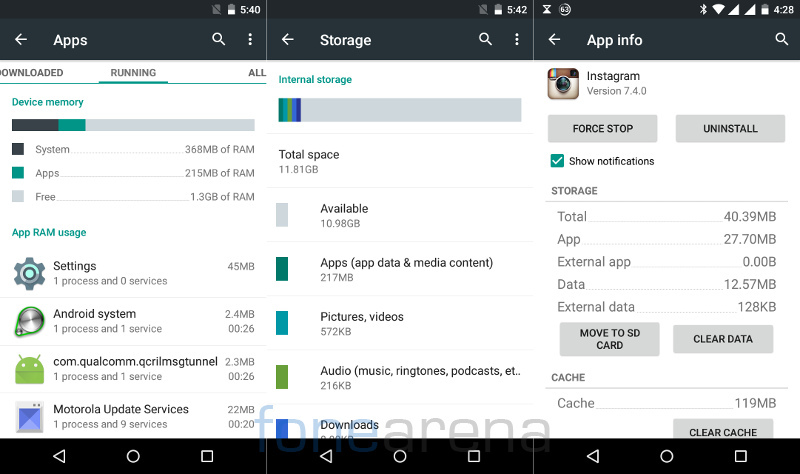 Out of 16GB of internal storage you get 10.98GB of usable storage. You can also move apps to the SD card, when you insert one, but it doesn’t have option to install apps in the SD card by default. Apart from the usual set of Google apps, it has Motorola Migrate that lets you migrate media, call, text messages and SIM contact from your old phone or move these from this phone to a new phone. It also has Moto app that was first introduced in the Moto E (2nd Gen). This has Assist, Actions and Display. Assist is the usual Moto Assist with Meeting and Sleeping actions. 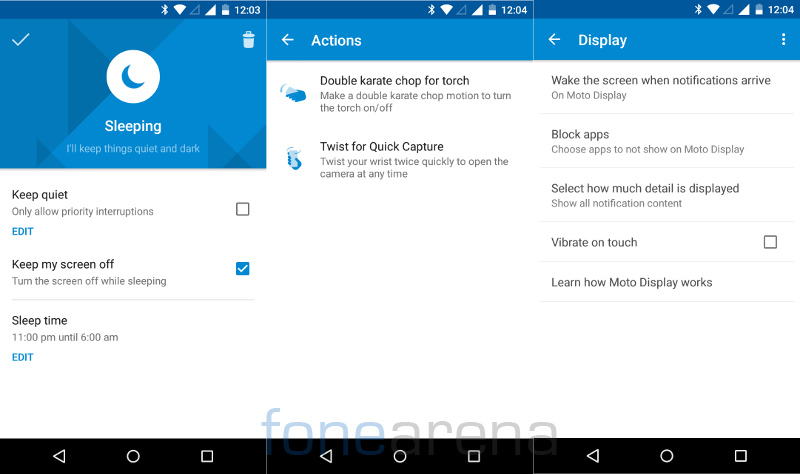 Moto Action has two features, Twist the phone to launch the phone’s camera to capture images quickly and double karate chop to turn the torch on/off. The Moto Display offers time at a glance when you pick up the phone and also offers notifications on the black screen when you receive them. You can swipe up to go to particular app that sent the notification or swipe either left or right to dismiss them. Moto Display compensates for the lack of LED notification light. Google Play Music is the default music player for playback. It has FM Radio with FM recording and RDS. 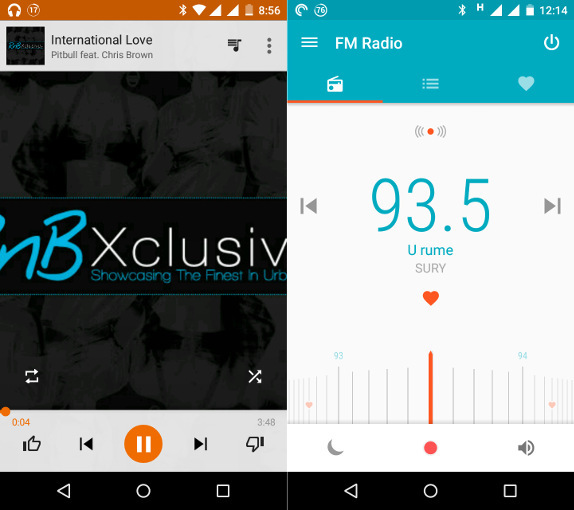 The FM Radio app has a new UI and an option that offers audio to be played without earphones, but this doesn’t work properly. It can play 1080p Full HD videos smoothly. The front-facing speaker is loud and audio through third-party earphones is quite good, but the bundled headset is just average. It has Dual SIM option in the settings that lets you customize each SIM cards. It has 4G connectivity with support for LTE bands 1, 3, 7, 8, 28 and 40. Both the SIM slots have 4G support, but you can use 4G on only one SIM at a time, while the other remains in 2G. 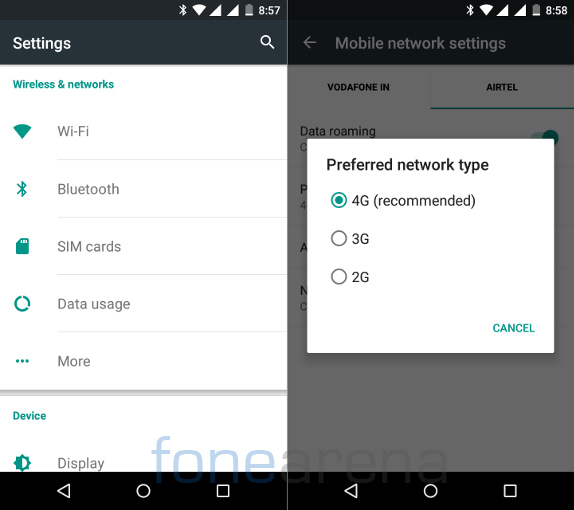 There is a connection priority option that lets you choose Data or Voice. If you prefer Data, when you receive incoming calls on the non-data enabled SIM, it will go to voicemail when data is active. 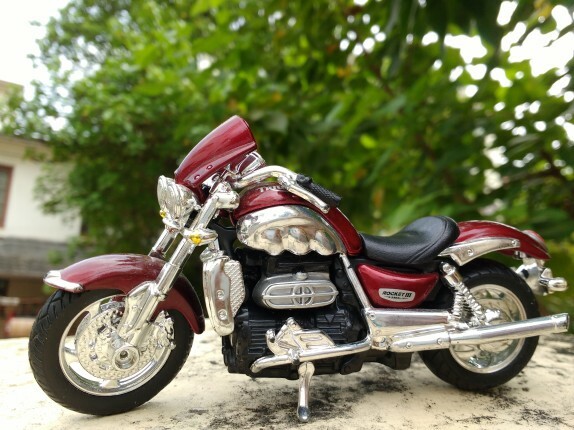 Other connectivity features include, WiFi 802.11 b/g/n, Bluetooth 4.0 LE and GPS. It also has USB OTG (on-the-go) support. 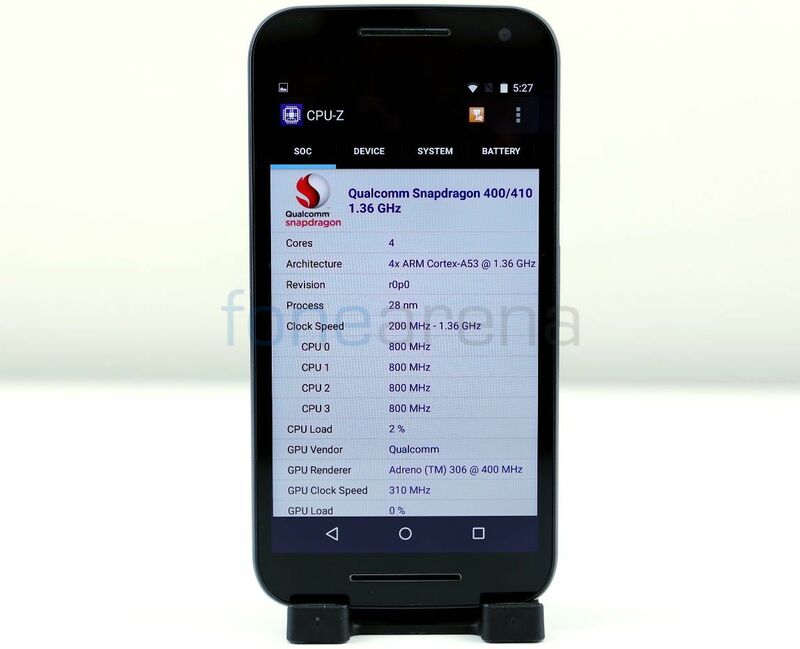 It is powered by a quad-core Snapdragon 410 (MSM8916) SoC that has four ARM Cortex-A53 CPUs clocked at 1.36 GHz per core, faster than most other Snapdragon 410-powered smartphones in which the CPU is clocked at 1.21 GHz per core. The performance is smooth without any lags, thanks to 2GB RAM multitasking is smooth too. The phone gets warm a bit on using 4G or 3G in hot conditions, but it doesn’t get too hot. Check out some synthetic benchmark scores below. 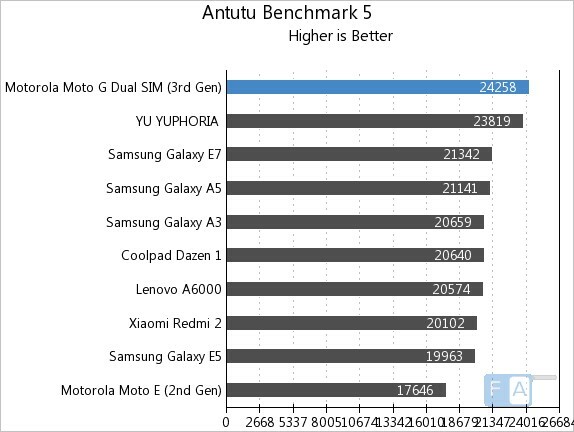 It topped the AnTuTu Benchmark 5 too by scoring 24258 points, better than other smartphones powered by the same chip. 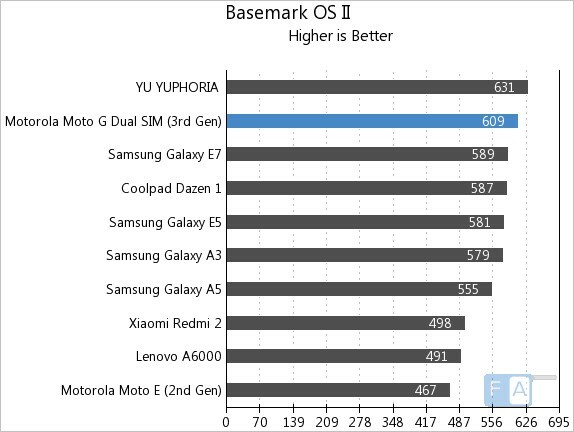 It scored 609 points in the Basemark OS II benchmark. 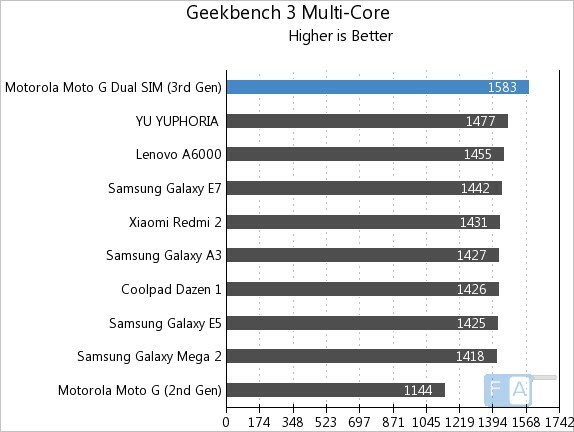 Check out the complete set of Moto G (3rd Gen) benchmarks here. 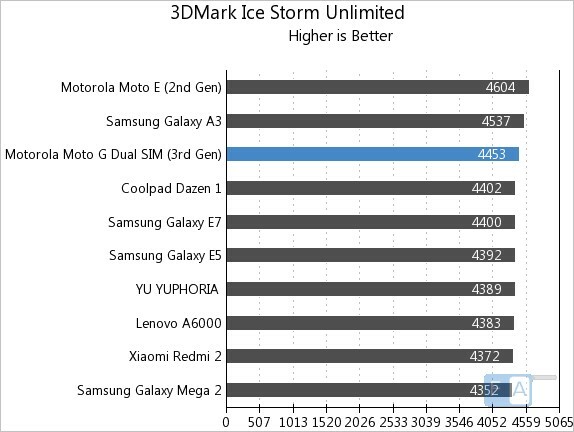 It has Adreno 306 GPU clocked at 400MHz. The gaming performance is good and the graphics decent in the high-end games we tried. Overall, the Moto G (3rd Gen) scored 3.5/5 in our gaming review. This is similar to last year’s Moto G. A processor with a faster GPU could have improved the gaming experience in the new Moto G. Check out the video to know more about the gaming performance of the smartphone in detail. 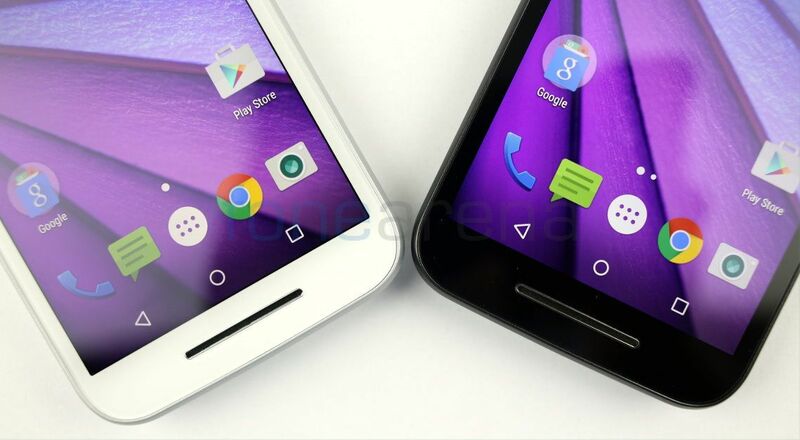 The new Moto G packs a 2,470 mAh built-in battery. Based on my usage that includes a couple of hours of music playback through earphones, 4G data for a couple of hours, few images, screen time of more than 2 and half hours and some gaming with both the SIM enabled all the time, it lasted for more than a day. You can enable battery saver to extend the battery life when the battery is low. 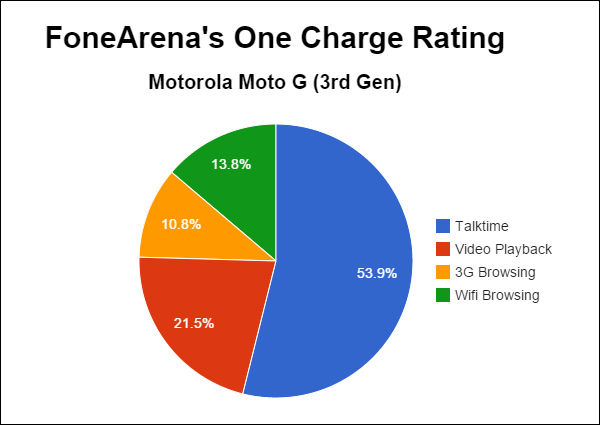 In our battery test the Moto G (3rd Gen) achieved a One Charge Rating of 11 hours and 50 minutes, mainly due to high scores in the talk time test. This is way better than Moto G 2nd Gen’s battery test rating of 8 hours and 27 minutes. Check out the complete set of Moto G 3rd Gen’s battery life test results here. 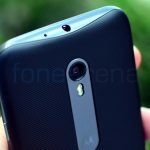 The first Moto G was a huge success and the second-generation Moto G was not that impressive, even though it added a microSD card slot. 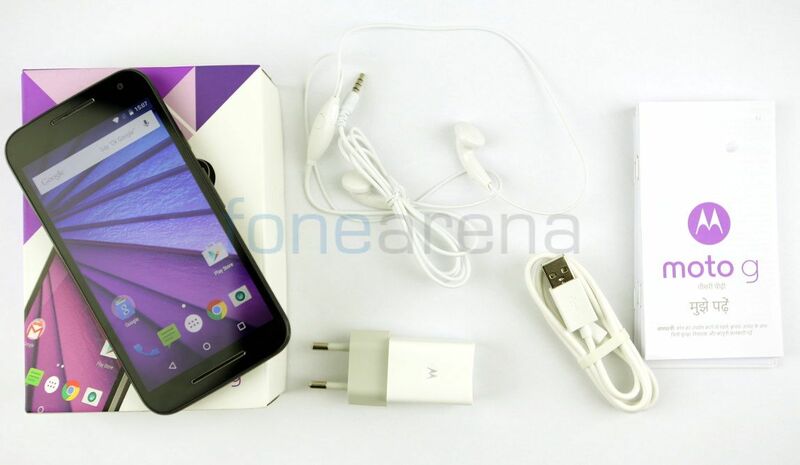 The new Moto G (3rd Gen) is a good successor that has a stylish design, solid build quality and a good battery life. 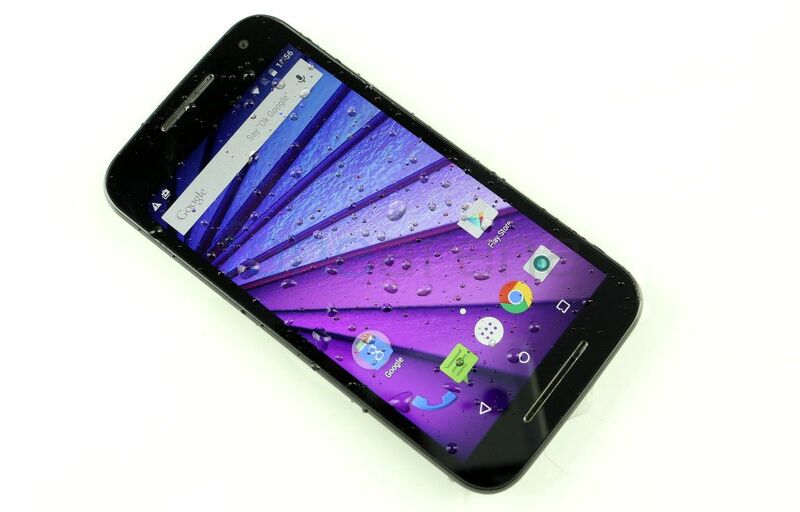 The main advantage of the new Moto G over other smartphones in the price range is the IPX7-rated water resistance. At a price of Rs. 12,999, the 2GB RAM with 16GB storage variant is recommend since it is just Rs. 1000 more than the base variant with 1GB RAM and 8GB storage. Even though Motorola could have offered a 1080p screen and a faster processor, the HD screen and the Snapdragon 410 SoC is good enough to offer a smooth performance and it doesn’t have any heating issues. Other competitors like the Lenovo K3 Note and the Xiaomi Mi 4i have a high-resolution 1080p display and a faster processor, but if you want a water resistant smartphone and stock Android experience in the price range, the new Moto G is the best choice. To summarize, here are the pros and cons of the smartphone.